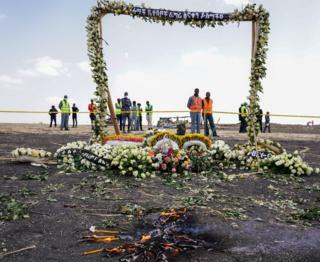 None of the bodies has yet been formally identified because of the impact when the Boeing 737 Max 8 aircraft crashed shortly after it took off for the Kenyan capital, Nairobi, killing all 157 people on board. 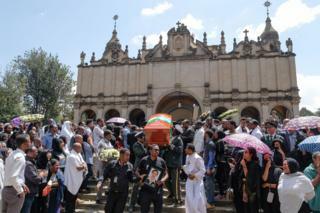 Some relatives were overcome with grief, while others threw themselves on the red coffins draped with the Ethiopian flag at the Holy Trinity Cathedral in Addis Ababa. Some family members have been given charred earth from the crash site to help remember their loved ones. Families have been told it could take up to six months to identify the remains. Meanwhile, flight data from the Ethiopian Airlines disaster a week ago suggest "clear similarities" with a crash off Indonesia last October, Ethiopia's transport minister has said. Airlines around the world have grounded their Boeing 737 Max 8 aircraft following the second fatal crash involving the plane in five months. 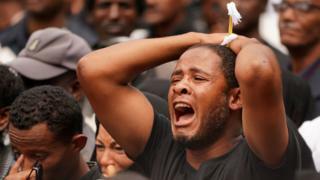 The BBC's Kalkidan Yibeltal in Addis Ababa says that temporary death certificates were issued ahead of Sunday's funeral service. 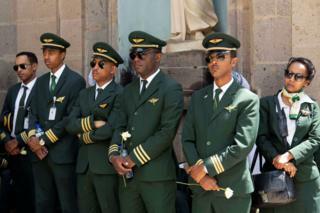 There was also a ceremony for Ethiopian Airlines staff at the city's Bole International Airport to pay their respects to the eight crew on board flight 302, Nairobi. 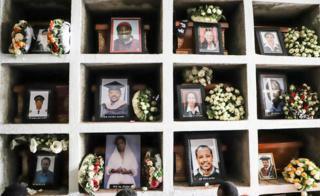 The BBC's Ferdinand Omondi, who was at the ceremony, says there was a sombre mood as candles were lit and prayers held. 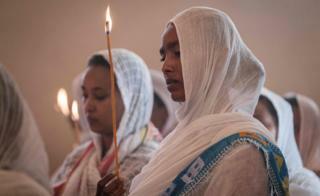 Many worshippers were wearing white from head to toe. Kenya's Transport Minister James Macharia told worshippers that bereaved families had taken bags of earth from the crash site as a memory of their loved ones. 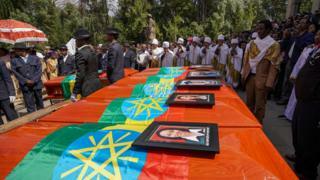 "The Ethiopian government allowed them to take samples of the earth where they lost their loved ones and bring that soil home," he said. But some relatives told our reporter that they would only get full closure when at least some body parts were handed over to them. 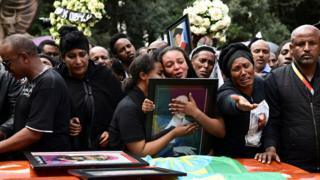 Relatives of the passengers killed in the incident are being encouraged to provide DNA samples either in Addis Ababa or at any overseas offices of Ethiopian Airlines. Mourners at the Bole International Airport held white flowers, the traditional colour of mourning in Ethiopia, Reuters news agency reports. "Our deep sorrow cannot bring them back," an Orthodox priest wearing a black turban and robes told the crowd gathered outside an airport hangar. 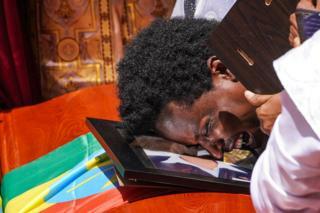 "This is the grief of the world," he said, as Ethiopian Airlines staff sobbed in each other's arms, Reuters reports. Ethiopia's transport minister said on Saturday it might take "considerable time" for investigators to find the cause of the crash involving the new aeroplane. "An investigation of such magnitude requires a careful analysis and considerable time to come up with something concrete," Dagmawit Moges told a news conference.